6. While he was still at Mallus, he was informed that Darius was encamped with all his force at Sochi, a place in the land of Assyria, distant about two days' march from the Assyrian Gates. Then indeed he collected the Companions and told them what was reported about Darius and his army. They urged him to lead them on as they were, without delay. At that time he commended them, and broke up the conference; but next day he led them forward against Darius and the Persians. On the second day he passed through the Gates and encamped near the city of Myriandrus; but in the night a heavy tempest and a violent storm of wind and rain occurred which detained him in his camp. Darius, on the other hand, up to this time was delaying with his army, having chosen a plain in the land of Assyria which stretched out in every direction, suitable for the immense size of his army and convenient for the evolutions of cavalry. Amyntas, son of Antiochus, the deserter from Alexander, advised him not to abandon this position, because the open country was favourable to the great multitude of the Persians and the vast quantity of their baggage. So Darius remained. But as Alexander made a long stay at Tarsus on account of his illness, and not a short one at Soli, where he offered sacrifice and conducted his army in proces sion, and moreover spent some time in marching against the Cilician mountaineers, Darius was induced to swerve from his resolution. He was also not unwilling to be led to form whatever decision was most agreeable to his own wishes; and being urged on by those who for the gratification of pleasure associated with him, and will associate for their injury with those who for the time are reigning, he came to the conclusion that Alexander was no longer desirous of advancing further, but was shrinking from an encounter on learning that Darius himself was marching against him. On all sides they were urging him on, asserting that he would trample down the army of the Macedonians with his cavalry. Nevertheless, Amyntas, at any rate, confidently afffirmed that Alexander would certainly come to any place where he heard Darius might be; and he exhorted him by all means to stay where he was. But the worse advice, because at the immediate time it was more pleasant to hear, prevailed; moreover perhaps he was led by some divine influence into that locality where he derived little advantage from his cavalry and from the very number of his men, javelins and bows, and where he could not even exhibit the mere magnificence of his army, but surrendered to Alex ander and his troops an easy victory. For it was already decreed by fate that the Persians should be deprived of the rule of Asia by the Mace donians, just as the Medes had been deprived of it by the Persians, and still earlier the Assyrians by the Medes. 7. Darius crossed the mountain range by what are called the Amanic Gates, and advancing towards Issus, came without being noticed to the rear of Alexander. Having reached Issus, he captured as many of the Macedonians as had been left behind there on account of illness. These he cruelly mutilated and slew. Next day he proceeded to the river Pinarus. As soon as Alexander heard that Darius was in his rear, because the news did not seem to him trustworthy, he embarked some of the Companions in a ship with thirty oars, and sent them back to Issus, to observe whether the report was true. The men who sailed in the thirty-oared ship discovered the Persians encamped there more easily, because the sea in this part takes the form of a bay. They therefore brought back word to Alexander that Darius was at hand. Alexander then called together the generals, the commanders of cavalry, and the leaders of the Grecian allies, and exhorted them to take courage from the dangers which they had already surmounted, asserting that the struggle would be between themselves who had been previously victorious and a foe who had already been beaten; and that the deity was acting the part of general on their behalf better than himself, by putting it into the mind of Darius to move his forces from the spacious plain and shut them up in a narrow place, where there was suffficient room for themselves to deepen their phalanx by marching from front to rear, but where their vast multitude would be useless to the enemy in the battle. He added that their foes were similar to them neither in strength nor in courage; for the Macedonians, who had long been practised in warlike toils accompanied with danger, were coming into close conflict with Persians and Medes, men who had become enervated by a long course of luxurious ease; and, to crown all, they, being freemen, were about to engage in battle with men who were slaves. He said, moreover, that the Greeks who were coming into conflict with Greeks would not be fighting for the same objects; for those with Darius were braving danger for pay, and that pay not high; whereas, those on their side were voluntarily defending the interests of Greece. Again, of foreigners, the Thracians, Paeonians, Illyrians, and Agrianians, who were the most robust and warlike of men in Europe, were about to be arrayed against the most sluggish and effeminate races of Asia. In addition to all this, Alexander was commanding in the field against Darius. These things he enumerated as evidences of their superiority in the struggle; and then he began to point out the great rewards they would win from the danger to be incurred. For he told them that on that occasion they would overcome, not merely the viceroys of Darius, nor the cavalry drawn up at the Granicus, nor the 20,000 Grecian mercenaries, but all the available forces of the Persians and Medes, as well as all the other races subject to them dwelling in Asia, and the Great King present in person. After this conflict nothing would be left for them to do, except to take possession of all Asia, and to put an end to their many labours. In addition to this, he reminded them of their brilliant achievements in their collective capacity in days gone by; and if any man had individually performed any distinguished feat of valour from love of glory, he mentioned him by name in commendation of the deed. He then recapitulated as modestly as possible his own daring deeds in the various battles. He is also said to have reminded them of Xenophon and the I0,000 men who accompanied him, asserting that the latter were in no way comparable with them either in number or in general excellence. Besides, they had had with them neither Thessalian, Boeotian, Peloponnesian, Macedonian, or Thracian horsemen, nor any of the other kinds of cavalry which were in the Macedonian army; nor had they any archers or slingers except a few Cretans and Rhodians, and even these were got ready by Xenophon on the spur of the moment in the very crisis of danger. And yet they put the king and all his forces to rout close to Babylon itself, and succeeded in reaching the Euxine Sea after defeating all the races which lay in their way as they were marching down thither. He also adduced whatever other arguments were suitable for a great commander to use in order to encourage brave men in such a critical moment before the perils of battle. They urged him to lead them against the foe without delay, coming from all sides to grasp the king's right hand, and encouraging him by their words. 8. Alexander then ordered his soldiers to take their dinner, and having sent a few of his horsemen and archers forward to the Gates to recon noitre the road in the rear, he took the whole of his army and marched in the night to occupy the pass again. When about midnight he had again got possession of it, he caused the army to rest the remainder of the night there upon the rocks, having posted vigilant sentries. At the approach of dawn he began to descend from the pass along the road; and as long as the space was narrow everywhere, he led his army in column, but when the mountains parted so as to leave a plain between them, he kept on opening out the column into the phalanx, marching one line of heavy armed infantry after another up into line towards the mountain on the right and towards the sea on the left. Up to this time his cavalry had been ranged behind the infantry; but when they advanced into the open country, he began to draw up his army in order of battle. First, upon the right wing near the mountain he placed his infantry guard and the shield-bearers, under the command of Nicanor, son of Parmenio; next to these the regiment of Coenus, and close to them that of Perdiccas. These troops were posted as far as the middle of the heavy-armed infantry to one beginning from the right. On the left wing first stood the regiment of Amyntas, then that of Ptolemy, and close to this that of Meleager. The infantry on the left had been placed under the command of Craterus; but Parmenio held the chief direction of the whole left wing. This general had been ordered not to abandon the sea, so that they might not be surrounded by the foreigners, who were likely to outflank them on all sides by their superior numbers. But as soon as Darius was certified of Alexander's approach for battle, he conveyed about 30,000 of his cavalry and with them 20,000 of his light-armed infantry across the river Pinarus, in order that he might be able to draw up the rest of his forces with ease. Of the heavy armed infantry, he placed first the 30,000 Greek mercenaries to oppose the phalanx of the Macedonians, and on both sides of these he placed 60,000 of the men called Cardaces, who were also heavy-armed infantry. For the place where they were posted was able to contain only this number in a single phalanx. He also posted 20,000 men near the mountain on their left and facing Alexander's right. Some of these troops were also in the rear of Alexander's army; for the mountain near which they were posted in one part sloped a great way back and formed a sort of bay, like a bay in the sea, and afterwards bending forwards caused the men who had been posted at the foot of it to be behind Alexander's right wing. The remaining multitude of Darius's light-armed and heavy-armed infantry was marshalled by nations to an unserviceable depth and placed behind the Grecian mercenaries and the Persian army arranged in phalanx. The whole of the army with Darius was said to number about 600,000 fighting men. As Alexander advanced, he found that the ground spread out a little in breadth, and he accordingly brought up his horsemen, both those called Companions, and the Thessalians as well as the Macedonians, and posted them with himself on the right wing. The Peloponnesians and the rest of the allied force of Greeks he sent to Parmenio on the left. When Darius had marshalled his phalanx, by a pre-concerted signal he recalled the cavalry which he had posted in front of the river for the express purpose of rendering the arranging of his army easy. Most of these he placed on the right wing near the sea facing Parmenio; because here the ground was more suitable for the evolutions of cavalry. A certain part of them also he led up to the mountain towards the left. But when they were seen to be useless there on account of the narrowness of the ground, he ordered most of these also to ride round to the right wing and join their comrades there. Darius himself occupied the centre of the whole army, inasmuch as it was the custom for the kings of Persia to take up that position, the reason of which arrangement has been recorded by Xenophon, son of Gryllus. 9. Meantime when Alexander perceived that nearly all the Persian cavalry had changed their ground and gone to his left towards the sea, and that on his side only the Peloponnesians and the rest of the Grecian cavalry were posted there, he sent the Thessalian cavalry thither with speed, ordering them not to ride along before the front of the whole array, lest they should be seen by the enemy to be shifting their ground, but to proceed without being seen in the rear of the phalanx. In front of the cavalry on the right, he posted the lancers under the command of Protomachus, and the Paeonians under that of Aristo; and of the infantry, the archers under the direction of Antiochus, and the Agrianians under that of Attalus. Some of the cavalry and archers also he drew up so as to form an angle with the centre towards the mountain which was in the rear; so that on the right, his phalanx had been drawn up separated into two wings, the one fronting Darius and the main body of Persians beyond the river, and the other facing those who had been posted at the mountain in their rear. On the left wing the infantry consisting of the Cretan archers and the Thracians under command of Sitalces were posted in front; and before these the cavalry towards the left. The Grecian mercenaries were drawn up as a reserve for all of them. (Jeffnote: The Penquin edition translates these troops as "foreign" troops not Greeks) When he perceived that the phalanx towards the right was too thin, and it seemed likely that the Persians would outflank him here considerably, he ordered two squadrons of the Companion cavalry, the Anthemusian, of which Peroedas, son of Menestheus, was captain, and that which was called Leugaean, under the command of Pantordanus, son of Cleander, to proceed from the centre to the right without being seen. Having also marched the archers, part of the Agrianians and some of the Grecian mercenaries up to his right in the front, he extended his phalanx beyond the wing of the Persians. But when those who had been posted upon the mountains did not descend, a charge was made by a few of the Agrianians and archers at Alexander's order, by which they were easily put to the rout from the foot of the mountain. As they fled to the summit he decided that he could make use of the men who had been drawn up to keep these in check, to fill up the ranks of his phalanx. He thought it quite sufficient to post 300 horsemen to watch the men on the mountain. 10. Having thus marshalled his men, he caused them to rest for some time, and then led them forward, as he had resolved that their advance should be very slow. For Darius was no longer leading the foreigners against him, as he had arranged them at first, but he remained in his position, upon the bank of the river, which was in many parts steep and precipitous; and in certain places, where it seemed more easy to ascend, he extended a stockade along it. By this it was at once evident to Alexander's men that Darius had become cowed in spirit. But when the armies were at length close to each other, Alexander rode about in every direction to exhort his troops to show their valour, mentioning with befitting epithets the names, not only of the generals, but also those of the captains of cavalry and infantry, and of the Grecian mercenaries as many as were more distinguished either by reputation or any deed of valour. From all sides arose a shout not to delay but to attack the enemy. At first he still led them on in close array with measured step, although he had the forces of Darius already in distant view, lest by a too hasty march any part of the phalanx should fluctuate from the line and get separated from the rest. But when they came within range of darts, Alexander himself and those around him, being posted on the right wing, dashed first into the river with a run, in order to alarm the Persians by the rapidity of their onset, and by coming sooner to close conflict to avoid being much injured by the archers. And it turned out just as Alexander had conjectured; for as soon as the battle became a hand-to-hand one, the part of the Persian army stationed on the left wing was put to rout; and here Alexander and his men won a brilliant victory. But the Grecian mercenaries serving under Darius attacked the Macedonians at the point where they saw their phalanx especially disordered. For the Macedonian phalanx had been broken and had disjoined towards the right wing, because Alexander had dashed into the river with eagerness, and engaging in a hand-to-hand conflict was already driving back the Persians posted there; but the Macedonians in the centre had not prosecuted their task with equal eagerness; and finding many parts of the bank steep and precipitous, they were unable to preserve the front of the phalanx in the same line. Here then the struggle was desperate; the Grecian mercenaries of Darius fighting in order to push the Macedonians back into the river, and regain the victory for their allies who were already flying; the Macedonians struggling in order not to fall short of Alexander's success, which was already manifest, and not to tarnish the glory of the phalanx, which up to that time had been commonly pro claimed invincible. Moreover the feeling of rivalry which existed between the Grecian and Macedonian races inspired each side in the conflict. Here fell Ptolemy, son of Seleucus, after proving himself a valiant man, besides about 120 other Macedonians of no mean repute. 11. Hereupon the regiments on the right wing, perceiving that the Persians opposed to them had already been put to rout, wheeled round towards the Grecian mercenaries of Darius and their own hard-pressed detachment. Having driven the Greeks away from the river, they extended their phalanx beyond the Persian army on the side which had been broken, and attacking the Greeks on the flank, were already beginning to cut them up. However the Persian cavalry which had been posted opposite the Thessalians did not remain on the other side of the river during the struggle, but came through the water and made a vigorous attack upon the Thessalian squadrons. In this place a fierce cavalry battle ensued; for the Persians did not give way until they perceived that Darius had fled and the Grecian mercenaries had been cut up by the phalanx and severed from them. Then at last there ensued a decided flight and on all sides. The horses of the Persians suffered much injury in the retreat, because their riders were heavily armed; and the horsemen themselves, being so many in number and retreating in panic terror without any regard to order along narrow roads, were trampled on and injured no less by each other than by the pursuing enemy. The Thessalians also followed them up with vigour, so that the slaughter of the cavalry in the flight was no less than it would have been if they had been infantry. But as soon as the left wing of Darius was terrified and routed by Alexander, and the Persian king perceived that this part of his army was severed from the rest, without any further delay he began to flee in his chariot along with the first, just as he was. He was conveyed safely in the chariot as long as he met with level ground in his flight; but when he lighted upon ravines and other rough ground, he left the chariot there, divesting himself both of his shield and Median mantle. He even left his bow in the chariot; and mounting a horse continued his flight. The night, which came on soon after, alone rescued him from being captured by Alexander; for as long as there was daylight the latter kept up the pursuit at full speed. But when it began to grow dark and the things before the feet became invisible, he turned back again to the camp, after capturing the chariot of Darius with the shield, the Median mantle, and the bow in it. For his pursuit had been too slow for him to overtake Darius, because, though he wheeled round at the first breaking asunder of the phalanx, yet he did not turn to pursue him until he observed that the Grecian mercenaries and the Persian cavalry had been driven away from the river. Of the Persians were killed Arsames, Rheomithres, and Atizyes, three of the men who had commanded the cavalry at the Granicus. Sabaces, viceroy of Egypt, and Bubaces, one of the Persian dignitaries, were also killed, besides about I00,000 of the private soldiers, among them being more than I0,000 cavalry. So great was the slaughter that Ptolemy, son of Lagus, who then accompanied Alexander, says that the men who were with them pursuing Darius, coming in the pursuit to a ravine, passed over it upon the corpses. The camp of Darius was taken forthwith at the first assault, containing his mother, his wife, who was also his sister, and his infant son. His two daughters, and a few other women, wives of Persian peers, who were in attendance upon them, were likewise captured. For the other Persians happened to have despatched their women along with the rest of their property to Damascus; because Darius had sent to that city the greater part of his money and all the other things which the Great King was in the habit of taking with him as necessary for his luxurious mode of living, even though he was going on a military expedition. The consequence was, that in the camp no more than 3,000 talents were captured; but soon after, the money in Damascus was also seized by Parmenio, who was despatched thither for that very purpose. Such was the result of this famous battle which was fought in the month Maimacterion, when Nicocrates was archon of the Athenians. 12. The next day, Alexander, though suffering from a wound which he had received in the thigh from a sword, visited the wounded, and having collected the bodies of the slain, he gave them a splendid burial with all his forces most brilliantly marshalled in order of battle. He also spoke with eulogy to those whom he himself had recognized performing any gallant deed in the battle, and also to those whose exploits he had learnt by report fully corroborated. He likewise honoured each of them individually with a gift of money in proportion to his desert. He then appointed Balacrus, son of Nicanor, one of the royal body-guards, vice roy of Cilicia; and in his place among the body-guards he chose Menes, son of Dionysius. In the place of Ptolemy, son of Seleucus, who had been killed in the battle, he appointed Polysperchon, son of Simmias, to the command of a brigade. He remitted to the Solians the fifty talents which were still due of the money imposed on them as a fine, and he gave them back their hostages. Nor did he treat the mother, wife, and children of Darius with neglect; for some of those who have written Alexander's history say that on the very night in which he returned from the pursuit of Darius, entering the Persian king's tent, which had been selected for his use, he heard the lamentation of women and other noise of a similar kind not far from the tent. Inquiring therefore who the women were, and why they were in a tent so near, he was answered by some one as follows, "O king, the mother, wife, and children of Darius are lamenting for him as slain, since they have been informed that you have his bow and his royal mantle, and that his shield has been brought back." When Alexander heard this, he sent Leonnatus, one of his Companions, to them, with injunctions to tell them, "Darius is still alive; in his flight he left his arms and mantle in the chariot; and these are the only things of his that Alexander has." Leonnatus entered the tent and told them the news about Darius, saying, moreover, that Alexander would allow them to retain the state and retinue befitting their royal rank, as well as the title of queens; for he had not undertaken the war against Darius from a feeling of hatred, but he had conducted it in a legitimate manner for the empire of Asia. Such are the statements of Ptolemy and Aristobulus. But there is another report, to the effect that on the following day Alexander himself went into the tent, accompanied alone by Hephaestion one of his Companions. The mother of Darius, being in doubt which of them was the king (for they had both arrayed themselves in the same style of dress), went up to Hephaestion, because he appeared to her the taller of the two, and prostrated herself before him. But when he drew back, and one of her attendants pointed out Alexander, saying he was the king, she was ashamed of her mistake, and was going to retire. But the king told her she had made no mistake, for Hephaestion was also Alexander. This I record neither being sure of its truth nor thinking it altogether unreliable. If it really occurred, I commend Alexander for his compassionate treatment of the women, and the confidence he felt in his companion, and the honour bestowed on him; but if it merely seems probable to historians that Alexander would have acted and spoken thus, even for this reason I think him worthy of commendation. 12.17 (1) In order that I may not seem to insist arbitrarily on the acceptance of my criticism of such famous writers, I will take one battle and a very celebrated one, a battle which took place at no very distant date and, what is most important, one at which Callisthenes himself was present. (2) I mean Alexander's battle with Darius in Cilicia. Callisthenes tells us that Alexander had already passed the narrows of the so-called Cilician Gates, while Darius had marched through the pass known as the Gates of Amanus and had descended with his army into Cilicia. (3) On learning from the natives that Alexander was advancing in the direction of Syria, he followed him up, and when he approached the pass, encamped on the banks of the river Pinarus. (4) The distance, he says, from the sea to the foot of the hills is not more than fourteen stades, (5) the river running obliquely across this space, with gaps in its banks just where it issues from the mountains, but in its whole course through the plain as far as the sea passing between steep hills difficult to climb. (6) Having given this sketch of the country he tells us that Darius and his generals, when Alexander turned and marched back to meet them, decided to draw up the whole phalanx in the camp itself in the original position, the river affording protection, as it ran close past the camp. (7) After this he says they drew up the cavalry along the sea-shore, the mercenaries next them at the brink of the river, and the peltasts next the mercenaries in a line reaching as far as the mountains. 12.18 (1) It is difficult to understand how they posted all these troops in front of the phalanx, considering that the river ran close past the camp, especially in view of their numbers, (2) for as Callisthenes himself says, there were thirty thousand cavalry and thirty thousand mercenaries. (6) Where, then, were the mercenaries posted, unless indeed they were drawn up behind the cavalry? (7) This he tells us was not so, as they were the first to meet the Macedonian attack. We must, then, of necessity, understand that the cavalry occupied that half of the space which was nearest to the sea and the mercenaries the half nearest the hills, (8) and from this it is easy to reckon what was the depth of the 9 cavalry and how far away from the camp the river must have been. After this he tells us that on the approach of the enemy, Darius, who was half way down the line, called the mercenaries himself from the wing to come to him. (11) Lastly, he says that the cavalry from the right wing advanced and attacked Alexander's cavalry, who received their charge bravely and delivering a counter charge fought stubbornly. (12) He forgets that there was a river between them and such a river as he has just described. 12.19 (1) Very similar are his statements about Alexander. He says that when he crossed to Asia he had forty thousand foot and four thousand five hundred horse, (2) and that when he was on the point of invading Cilicia he was joined by a further force of five thousand foot and eight hundred horse. (3) Suppose we deduct from this total three thousand foot and three hundred horse, a liberal allowance for those absent on special service, there still remain forty-two thousand foot and five thousand horse. (4) Assuming these numbers, he tells us that when Alexander heard the news of Darius' arrival in Cilicia, he was a hundred stades away and had already traversed the pass. (5) In consequence he turned and marched back through the pass with the phalanx in front, followed by the cavalry, and last of all the baggage-train. (6) Immediately on issuing into the open country he re-formed his order, passing to all the word of command to form into phalanx, making it at first thirty-two deep, changing this subsequently to sixteen deep, and finally as he approached the enemy to eight deep. (7) These statements are even more absurd than his former ones. For with the proper intervals for marching order a stade, when the men are sixteen deep, will hold sixteen hundred, each man being at a distance of six feet from the next. (8) It is evident, then, that ten stades will hold sixteen thousand men and twenty stades twice as many. (9) From all this it is quite plain that when Alexander made his army into sixteen deep the line necessarily extended for twenty stades, and this left all the cavalry and ten thousand of the infantry over. tance of about forty stades from the enemy. (2) It is difficult to conceive of anything more absurd than this. Where, especially in Cilicia, could one find an extent of ground where a phalanx with long spears could advance for 40 stades in a line 20 stades long? . . .
(4) For he tells us that the torrents descending from the mountains have formed so many clefts in the plain that most of the Persians in their flight perished in such fissures. But, it may be said, Alexander wished to be prepared for the appearance of the enemy [and the formation described by Callisthenes is not a reasonable preparation]. . .
(8) But other things apart, Alexander did not even, according to Callisthenes, send his cavalry out in front when advancing in line over flat ground, but apparently placed them alongside the infantry. 17.22 (1) It would be too long a story to mention all the other absurdities of his narrative, and it will suffice to point out a few. (2) He tells us that Alexander in drawing up his army was most anxious to be opposed to Darius in person, and that Darius also at first entertained the same wish, but afterwards changed his mind. . . .
(4) How, we ask, did a phalanx of heavy-armed men manage to mount the bank of a river which was steep and overgrown with brambles? . . . (5) Such an absurdity cannot be attributed to Alexander [(6) who everyone agrees knew what he was doing]. . . We should rather attribute it to the writer, who is so ignorant as to be unable to distinguish the possible from the impossible in such matters. (5) Alexander cast his glance in all directions in his anxiety to see Darius, and as soon as he had identified him, he drove hard with his cavalry at the king himself, wanting not so much to defeat the Persians as to win the victory with his own hands. (6) By now the rest of the cavalry on both sides was engaged and many were killed as the battle raged indecisively because of the unevenly matched fighting qualities of the two sides. . . .
(9) Now the macedonian phalanx and the Persian infantry were engaged only briefly, for the rout of the cavalry had been, as it were, a prelude of the whole victory. Soon, all of the Persians were in retreat and as so many tens of thousands were making their escape through narrow passes the whole countryside was soon covered with bodies. (6) In the course of the battle there died on the Persian side more than 100,000 infantry and not less than 10,000 cavalry; on the Macedonian side, the casualties were 300 infantry and 150 cavalry. This was the conclusion of the battle at Issus of Cilicia. The translation of section 17.34 of the World history was made by C. Bradford Welles. The Persian Oxyathres was the brother of Darius and a man highly praised for his fighting qualities. When he saw Alexander riding at Darius and feared that he would not be checked, he was seized by the desire to share his brother's fate. Ordering the best of the horsemen in his company to follow him, he threw himself with them against Alexander, thinking that this demonstration of brotherly love would bring him high renown among the Persians. He took up the fight directly in front of Darius's chariot and there, engaging the enemy skillfully and with a stout heart slew many of them. 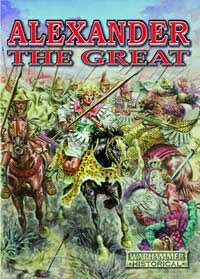 The fighting qualities of Alexander's group were superior, however, and quickly many bodies lay piled high about the chariot. No Macedonian had any other thought than to strike the king, and in their intense rivalry to reach him took no thought for their own lives. Many of the noblest Persian princes perished in this struggle, among them Atizyes and Rheomithres and Sabaces, the satrap of Egypt. Many of the Macedonians fell also, and Alexander was wounded in the thigh, for the enemy pressed about him. The horses which were harnessed to the yoke of Darius's chariot were covered by wounds and terrified by the piles of dead about them. They refused to answer to their bridles, and came close to carrying off Darius into the midst of the enemy, but the king himself, in extreme peril, caught up the reigns, being forced to throw away the dignity of his position and to violate the ancient custom of the Persian kings. A second chariot was brought up by Darius's attendants and in the confusion -as he changed over to it in the face of constant attack- he fell into a panic terror. Seeing their king in this state, the Persians with him turned to flee. There was at this time in Darius's army a Macedonian refugee, named Amyntas, one who was pretty well acquainted with Alexander's character. This man, when he saw Darius intended to fall upon the enemy in the passes and defiles, advised him earnestly to keep where he was, in the open and extensive plains, it being the advantage of a numerous army to have field-room enough when it engaged with a lesser force. Darius, instead of taking his counsel, told him he was afraid the enemy would endeavour to run away, and so Alexander would escape out of his hands. "That fear," replied Amyntas, "is needless, for assure yourself that far from avoiding you, he will make all the speed he can to meet you, and is now most likely on his march toward you." But Amyntas's counsel was to no purpose, for Darius immediately decamping, marched into Cilicia at the same time that Alexander advanced into Syria to meet him; and missing one another in the night, they both turned back again. Alexander, greatly pleased with the event, made all the haste he could to fight in the defiles, and Darius to recover his former ground, and draw his army out of so disadvantageous a place. For now he began to perceive his error in engaging himself too far in a country in which the sea, the mountains, and the river Pinarus running through the midst of it, would necessitate him to divide his forces, render his horse almost unserviceable, and only cover and support the weakness of the enemy. Fortune was not kinder to Alexander in the choice of the ground, than he was careful to improve it to his advantage. For being much inferior in numbers, so far from allowing himself to be outflanked, he stretched his right wing much further out than the left wing of his enemies, and fighting there himself in the very foremost ranks, put the barbarians to flight. In this battle he was wounded in the thigh, Chares says, by Darius, with whom he fought hand-to-hand. But in the account which he gave Antipater of the battle, though indeed he owns he was wounded in the thigh with a sword, though not dangerously, yet he takes no notice who it was that wounded him. Nothing was wanting to complete this victory, in which he overthrew above an hundred and ten thousand of his enemies, but the taking the person of Darius, who escaped very narrowly by flight. However, having taken his chariot and his bow, he returned from pursuing him, and found his own men busy in pillaging the barbarians' camp, which (though to disburden themselves they had left most of their baggage at Damascus) was exceedingly rich. But Darius's tent, which was full of splendid furniture and quantities of gold and silver, they reserved for Alexander himself, who, after he had put off his arms, went to bathe himself saying, "Let us now cleanse ourselves from the toils of war in the bath of Darius." "Not so," replied one of his followers, "but in Alexander's rather; for the property of the conquered is and should be called the conqueror's." Here, when he beheld the bathing vessels, the water-pots, the pans, and the ointment boxes, all of gold curiously wrought, and smelt the fragrant odours with which the whole place was exquisitely perfumed, and from thence passed into a pavilion of great size and height, where the couches and tables and preparations for an entertainment were perfectly magnificent, he turned to those about him and said, "This, it seems, is royalty." But as he was going to supper, word was brought him that Darius's mother and wife and two unmarried daughters, being taken among the rest of the prisoners, upon the sight of his chariot and bow, were all in mourning and sorrow, imagining him to be dead. After a little pause, more lively affected with their affliction than with his own success, he sent Leonnatus to them, to let them know Darius was not dead, and that they need not fear any harm from Alexander, who made war upon him only for dominion; they should themselves be provided with everything they had been used to receive from Darius. This kind message could not but be very welcome to the captive ladies, especially being made good by actions no less humane and generous. For he gave them leave to bury whom they pleased of the Persians, and to make use for this purpose of what garments and furniture they thought fit out of the booty. He diminished nothing of their equipage, or of the attentions and respect formerly paid them, and allowed larger pensions for their maintenance than they had before. But the noblest and most royal part of their usage was, that he treated these illustrious prisoners according to their virtue and character, not suffering them to hear, or receive, or so much as to apprehend anything that was unbecoming. So that they seemed rather lodged in some temple, or some holy virgin chambers, where they enjoyed their privacy sacred and uninterrupted, than in the camp of an enemy. Nevertheless Darius's wife was accounted the most beautiful princess then living, as her husband the tallest and handsomest man of his time, and the daughters were not unworthy of their parents. But Alexander, esteeming it more kingly to govern himself than to conquer his enemies, sought no intimacy with any one of them, nor indeed with any other women before marriage, except Barsine, Memnon's widow, who was taken prisoner at Damascus. She had been instructed in the Grecian learning, was of a gentle temper, and by her father, Artabazus, royally descended, with good qualities, added to the solicitations and encouragement of Parmenio, as Aristobulus tells us, made him the more willing to attach himself to so agreeable and illustrious a woman. Of the rest of the female captives, though remarkably handsome and well proportioned, he took no further notice than to say jestingly that Persian women were terrible eyesores. And he himself, retaliating, as it were, by the display of the beauty of his own temperance and self-control, bade them be removed, as he would have done so many lifeless images. When Philoxenus, his lieutenant on the sea-coast, wrote to him to know if he would buy two young boys of great beauty, whom one Theodorus, a Tarentine, had to sell, he was so offended that he often expostulated with his friends what baseness Philoxenus had ever observed in him that he should presume to make him such a reproachful offer. And he immediately wrote him a very sharp letter, telling him Theodorus and his merchandise might go with his good-will to destruction. Nor was he less severe to Hagnon, who sent him word he would buy a Corinthian youth named Crobylus, as a present for him. And hearing that Damon and Timotheus, two of Parmenio's Macedonian soldiers, had abused the wives of some strangers who were in his pay, he wrote to Parmenio, charging him strictly, if he found them guilty, to put them to death, as wild beasts that were only made for the mischief of mankind. In the same letter he added, that he had not so much as seen or desired to see the wife of Darius, nor suffered anybody to speak of her beauty before him. He was wont to say that sleep and the act of generation chiefly made him sensible that he was mortal; as much as to say, that weariness and pleasure proceed both from the same frailty and imbecility of human nature. Alexandretta, or Iskanderun (med. Scanderoon), is a town of southeast Turkey (claimed also by Syria), situated in the northeast angle of the Levantine Mediterranean on the southeast of the gulf to which it gives a title. Its population in 1900 was about 10,000, two-thirds Muslims. Current population is around 175,000. Iskanderun preserves the name, but probably not the exact site, of Alexandria ad Issum, founded by Alexander the Great in 333 BC, about 23 miles south of the scene of his victory, to supersede Myriandrus as key of the Syrian Gates (Beilan Pass). The importance of the place ever since has been derived from its relation to this pass, the easiest approach to the open ground of Hatay and Northern Syria; and this relation has prevailed over the extreme unhealthiness of the site, which lies on marshy deltaic ground, screened by the horseshoe of Elma Dagh from all purifying influences of north and east winds. As the main outlet for the overland trade from Baghdad and India, whose importance was great until the establishment of the Egyptian overland route, the place was a great resort, first of Genoese and Venetian merchants, then of those of West and North European nations. The British Levant (Turkey) Company maintained an agency and factory here for 200 years, till 1825, in spite of appalling mortality among its employees. Alexandretta is still the main port for the Aleppo region, to which a good chaussee leads over the Beilan Pass, and it has a considerable export trade in tobacco, silk, cereals, liquorice, textiles. The health of the place has improved with the draining of the marshes and the provision of a better supply of water, but still leaves much to be desired. The wealthier inhabitants have summer residences at Beilan near the summit of the pass, long a stronghold of freebooting Dere Beys and the scene of the victory won by Ibrahim Pasha in 1832, which opened Cilicia to his advance. The distance by road to Aleppo has been shortened to about 70 miles, and Antioch is about 45 miles distant by a branch of the same chaussee. Alexandretta became prominent in recent popular culture when named as the location of the Grail shrine in Steven Spielberg's Indiana Jones and the Last Crusade; the location actually shown in the film, however, was based on Petra, in Jordan.